Page 9, Stockton, Chautauqua Co., NY, dated 16th of February 1892. This census year Marleah seems to be using the name Mary (or this might be a new wife!) and she is once again much older than Layton. 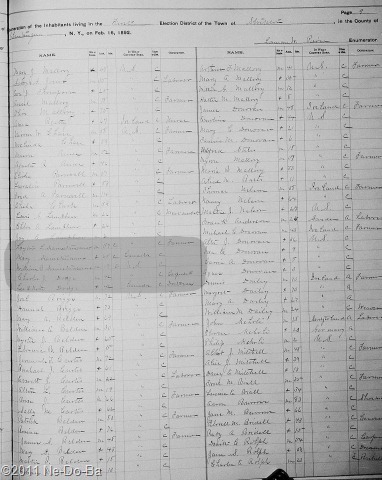 It appears the 1880 census ages may have been more accurate than the 1875 ages. With luck I will find a few more census and be able to form a reasonable conclusion about their ages. All members of the Kanistanaux household are listed as “C” for colored. The only thing I should assume from this is that they are not “white”. This year Willie is now called William and his place of birth changed from Canada to the U.S.. It is interesting to note that Layton is a farmer. Neither he nor his wife are recorded as Doctors. Oh, but look at who is a doctor and living right next to the Kanistanaux household. This census does not distinguish between separate household so they might actually be living in the same household. Since the name is so unusual, I am pretty sure this is the Dr. Lee-O-Netto I have been searching for. Now I have an idea of her age and I can look for a marriage record. I should also go back to the 1880 Census to see if I can find a Charles Dodge household. Since some members of this family group were born in Canada, I do want to make sure I check Canadian Census as well as U.S. Census. They could be traveling back and forth across the border and may have relatives still in Canada. They might also be leaving “border crossing” documents worth tracking down.